Inspiration for a transitional formal living room in Canberra - Queanbeyan with beige walls, dark hardwood floors, a standard fireplace, a brick fireplace surround and no tv. 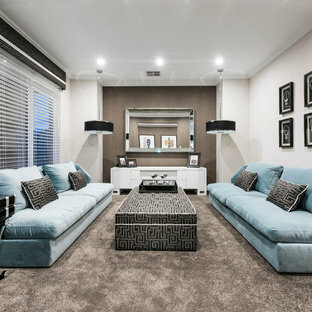 Photo of a contemporary formal living room in Perth with beige walls, carpet and no tv. 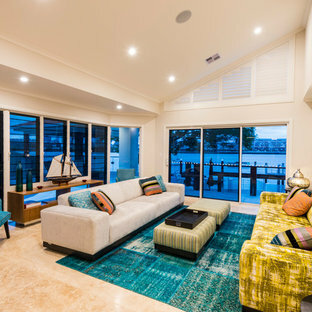 This is an example of a beach style living room in Sydney with beige walls, carpet and grey floor. 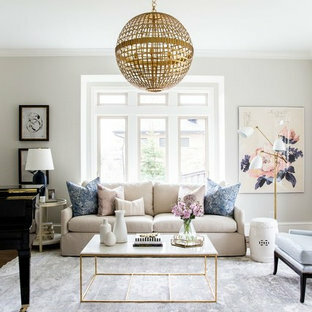 Inspiration for a transitional living room in Sydney with beige walls, medium hardwood floors and brown floor. 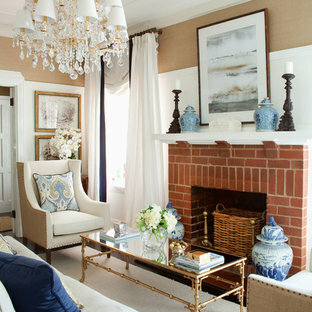 This lounge room is elegant and timeless. We added white wainscotting to give the room architectural detail and it made such a difference. We then painted the plaster above the wainscotting a little darker so the white had a bit of contrast. 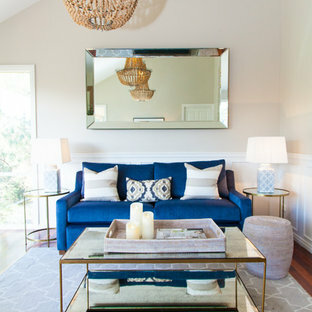 The navy sofa makes the room very elegant but details like the wicker side table and timber beaded chandeliers help to create a more relaxed look. 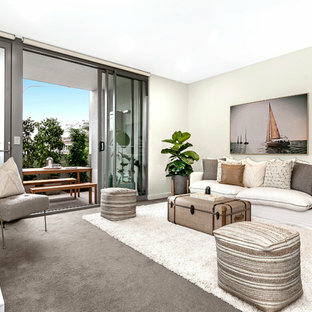 Photo of a beach style living room in Sydney with beige walls, light hardwood floors, a wall-mounted tv and brown floor. Mid-sized contemporary open concept living room in Perth with beige walls, light hardwood floors, a wall-mounted tv and brown floor. Contemporary living room in Brisbane with beige walls and a wall-mounted tv. This is an example of a transitional living room in Hobart with beige walls, medium hardwood floors and brown floor. 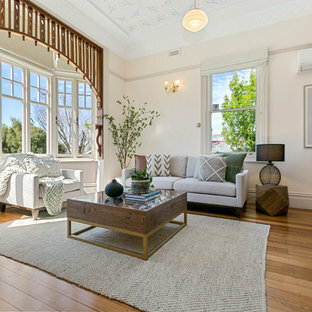 Photo of a transitional open concept living room in Sydney with beige walls, light hardwood floors, a freestanding tv and beige floor. Photo of a contemporary formal enclosed living room in Melbourne with beige walls, beige floor and porcelain floors. Design ideas for a mid-sized contemporary living room in Melbourne with beige walls and dark hardwood floors. Design ideas for a contemporary open concept living room in Melbourne with porcelain floors, a standard fireplace, beige walls, a stone fireplace surround and beige floor. This is an example of a mid-sized transitional enclosed living room in Other with beige walls, carpet, no fireplace and grey floor. This is an example of a mid-sized beach style formal open concept living room in Melbourne with beige walls, no fireplace and beige floor. Contemporary formal enclosed living room in Canberra - Queanbeyan with beige walls, medium hardwood floors, a standard fireplace and brown floor. Inspiration for a traditional open concept living room in Adelaide with beige walls, medium hardwood floors, a standard fireplace, a wall-mounted tv and yellow floor.